Home > Blog > How should you get a tattoo removed? Unfortunately more and more people are coming to regret their tattoos. Whether it is because it never turned out quite how you expected or it just no longer quite fits you, luckily there are now workable tattoo removal methods. I am not going to go through all of the different methods in detail because I believe there really is only one truly effective with minimal side effects method for doing this – Laser Tattoo Removal. Really your options are tattoo removal creams, surgical incision and Laser removal. On researching tattoo removal creams it seems to be very hit and miss with a lot more bad reports than good. People often turn to this option as it is much cheaper and you can just use it at home. The problem is there doesn’t seem to be great regulation on these creams and some have been found to have acid or other dangerous chemicals in them. So though you have a possibility of a result the risks are pretty high. Surgical incision really is as it sounds. You are literally cutting the tattoo out of your skin and sowing it back together again. Really unless your tattoo is horrific I would never recommend this as you are certainly going to be left with scarring. As soon as Laser tattoo removal came on the market this one has pretty much dropped out as a generally used method. 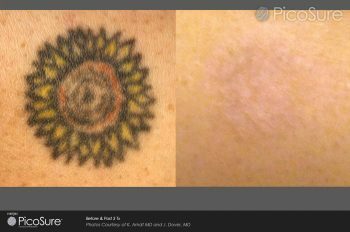 Laser tattoo removal really is the main method on the market simply because it works and does not leave any side effects on your skin. The laser simply breaks up the ink into tiny particles which then get reabsorbed into your body and excreted out, it does not affect the surrounding tissue. It is effective and leaves no side effects so it really has everything you are going for with tattoo removal and you can see why it is the only method I would recommend! Find out about the PicoSure laser by clicking this page.